The Rocky Mountains are known as a prime fishing destination, and as such, rainbow trout is often on the menu in Colorado, whether that's at a restaurant, in homes, or at campsites. 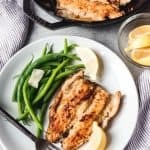 This easy, classic Pan Fried Trout recipe makes a delicious, quick dinner of store-bought or fresh caught rainbow trout by lightly dredging it in seasoned flour then quickly searing it in a hot skillet with a little butter. Pat the filleted fish dry with paper towels. In a shallow pan, combine the flour, salt and pepper. Dredge the trout in the flour by pressing it down on both sides and shaking off the excess flour. Heat a large cast iron skillet or other nonstick pan over medium high heat and melt the butter in it. Add the olive oil, then when hot, lay the trout fillets skin side down in the pan and cook for 3-5 minutes. Carefully flip with a thin, wide spatula and cook on the other side for another 3-5 minutes until golden brown, nearly opaque and the fish flakes easily with a fork. Don't overcook the fish! Serve with lemon wedges for squeezing over the top of the pan fried trout. Depending on the size of the trout, you may want 1 whole trout person, or less if they are particularly large.